Over the past week or so Google has released a slew of updates to its search operation. Some of these are somewhat controversial (personalised search) and some are just aesthetic changes (minimalist homepage) but Google seems to have ramped up their refinement process for the coming festive season. Here are just some of the new updates. From around the beginning of December, Google will start tailoring your search results based on previous browsing history, whether you are logged into your Google account or not(This review assumes that you are logged out). In order to allay privacy concerns you can opt out if you wish but most people using Google will be using personalised search by default. Google accomplishes this finding your favoured sites (indicated by which ones you most often click through to) and ranking sites from that brand or theme higher in your particular search results. This means Dymocks might be top of the SER’s for the keyword ‘books’ while for another person the same search will yield Angus & Robertson as the top positioned site. This doesn’t mean the other ranking factors are simply ignored however; they are simply used in conjunction with the personalised result factors. With this version of personalised search ( signed out of Google account), Google can only guess at your preference from what you click on, clicks are what your personalised search is based on, not search history or surfing habits. Now you may think this has doom and gloom implications for search engine optimisation, well it doesn’t, not yet anyway. First, Google is going to have to collect huge amounts of click data in order to understand and use your preferences within the SERPS. Good structured pages with terrific content, correctly used HTML attributes and links will still play the majority role in the ranking of sites, whether personalised search takes effect or not. We’re not sure how much weighting the personalised search factor will have within the entire Google algorithm, but I wouldn’t be surprised if people get near identical SERPS, regardless of their click history and habits. I have a feeling they may use the old Google 80/20 rule when implementing personalised search, i.e. 8 ‘normal results’ and 2 results impacted on by personalised search for each SERP. Now unlike some of the other tweaks and updates that Google has implemented over the past month or so this is pretty much a purely aesthetic change. When the search page is first loaded, you only see the logo, search box and the search buttons. When you move your mouse the rest of the search page ‘fades in’. This is something that Google has been testing for a while, for example it only worked on Chrome for a while and then periodically for other browsers. The only reason I can think of for this change is to funnel more people to start searching right away, rather than exploring the other links on the page. 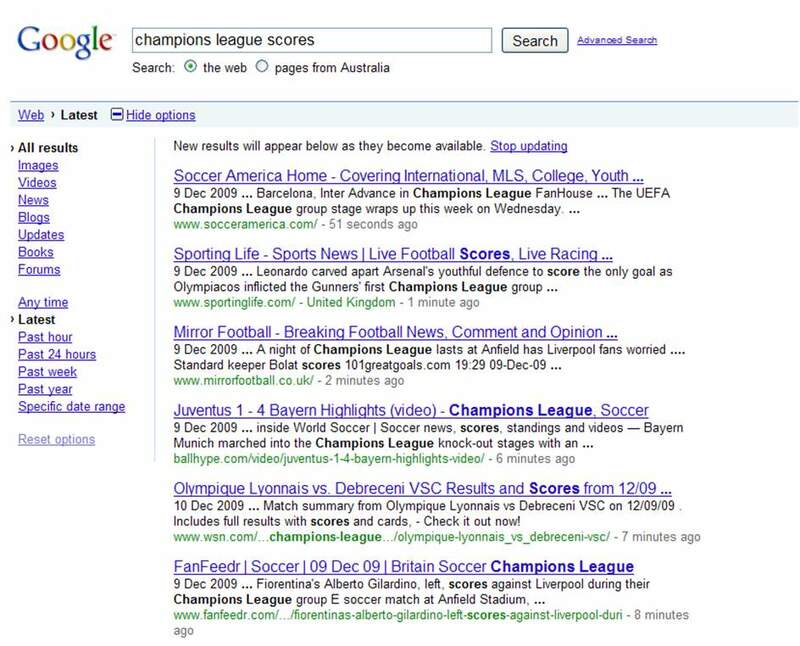 Google also announced that Google Real Time search has been rolled out. This feature is going to be rolled out in an incremental process over the next few weeks. Essentially Google is going to start indexing tweets, Facebook status updates (where made publicly visible by the Facebook user and this feature will be rolled out at a later stage) and other forms of real-time information. According to Google, they are processing over ‘a billion documents a day’ from the real-time web. In order to activate this feature you need to click on the show options link just above the results. This opens a whole heap of options, in order to activate the Google real-time results click on latest link. Then just sit back and watch new results blend into the top of your SERPS. 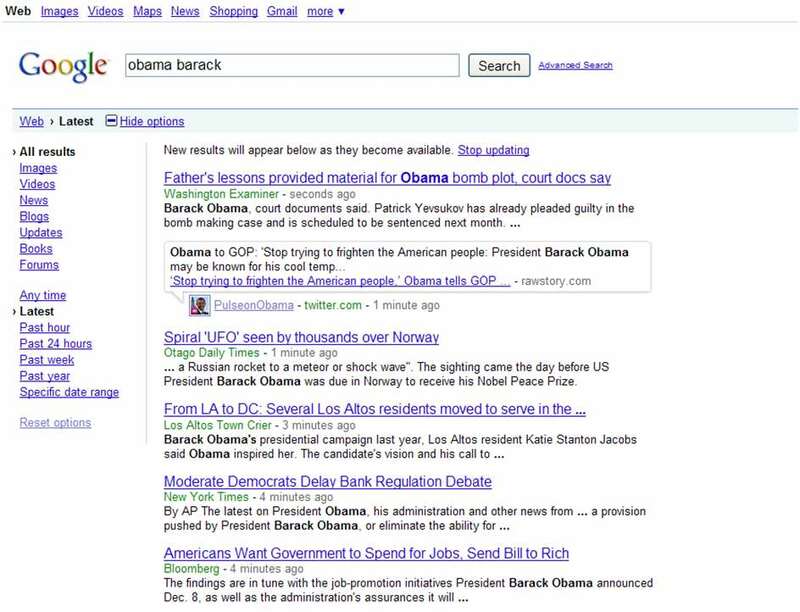 Below is an example of my search for Obama, note the time next to each result. Was this feature an absolute necessity for Google to survive? No, but it’s a ‘nice to have’ feature, as for me, it’s easier to keep up with my UEFA champions league scores. Google announced a whole raft of search capabilities for mobile phones (and in particular android enabled phones). In terms of Google Voice search, Japanese, Mandarin and English are all now supported as well as several more phone models, including; Blackberries, Android powered mobiles and Nokia’s. Search By location is a really interesting feature. According to the Google announcement, people with Google Maps on Android 1.6+ devices, can just press on the map for an extended period and ten of the closest points of interest (restaurants, shops etc) will be revealed to you. Nice feature, especially if you are bored and stuck somewhere for an extended period. Now this is a feature that really interests me, If Google can pull it off correctly it is going to be massive! This feature is currently a labs product that only users of Android 1.6+ devices can use. Essentially, you take a picture of an object, send it to Google and if they are able to recognise the object it returns relevant search results regarding the object. Take photos in areas with good lighting. Zoom in as much as possible. Use your phone in “left landscape” orientation (with your right thumb pressing the shutter). Hold your hands steady, and use the on-screen shutter button. Imagine the capabilities, you are in a foreign country, you are doing the touristy/sightseeing thing, you want more information on an odd relic you are perusing so you take a picture and voila, all the information right on your mobile, very cool. There are some other features like Google living stories, news rendered in a new and dynamic way. Updates to the Google Web Kit, including ways to speed up web apps. Loading time/web site performance is slated to be a big indicator in terms of search results in 2010. Martin has written a great post on Google and speed. As a result of the speed factor, Google has added another tool in Google Webmaster Tools where you can check the performance of your site. Google has also announced that extensions for Chrome are also now available. Wow, Google has been busy and I for one am looking forward to playing around with these news features and figuring out how they benefit me and the SEO I perform. Thanks for the comment Jody. I think we all wish we knew how the algorithm worked on any kind of level :) Thanks for the tweet too. Excellent summary. Wondering how the algorithm works for positioning real time results (tweets) versus traditional indexed results. When it comes to SEO, change has become the new standard.